A big part of our mission is to support the local farmers, fishers, foragers, and producers that are at the heart of farmers markets across Rhode Island. We provide resources along with promotional support to help grow the local food economy and ensure our state continues to provide vital marketplaces for local growers and eaters. Our goal is to foster markets with a diversity of locally grown and produced foods that are unrivaled in quality and freshness, and we strive to ensure that our markets are accessible to all segments of the population. We operate nine outdoor farmers markets May–October, near neighborhoods with limited access to fresh foods. We offer programs at these markets to make fresh options more affordable for shoppers with SNAP and WIC. It’s important that our vendors can accept these tender types. SNAP purchases are facilitated through our Fresh Bucks system, but we require vendors to accept WIC and SFMNP coupons. For details, see the Market Vendor Guide below. 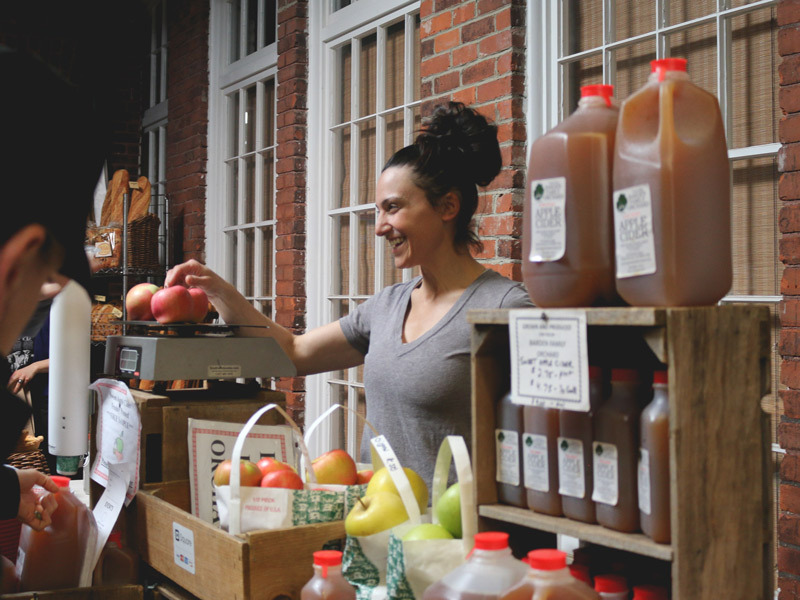 The Pawtucket Wintertime Farmers Market is the largest indoor farmers market of its kind in New England, and features over 80 weekly and rotating vendors throughout the season. The market is located inside the Hope Artiste Village (a renovated mill building) in Pawtucket, RI. The application for this market is generally released in mid-June, with applications due in early August. Please refer to the application below for specific deadlines. Over the course of the farmers market season, 80 percent of what you sell must be grown on your own farm. 100 percent must be sourced from farms in RI, MA, or CT. Products sourced outside of RI, MA, and CT can be reviewed on a case-by-case basis (contact markets@farmfreshri.org with questions). We require the display of the farm and state origins of the purchased food at your stand each week. Vendors must provide receipts, if requested, of items in question. Farm Fresh RI reserves the right to inspect participating farms. By participating in Farm Fresh RI's markets, you hereby consent to such quality control inspections. A committee, comprised of Farm Fresh RI staff and farmers from the community, will organize the farm visits. We expect to be able to visit your operation within 14 days of request. Farm Fresh RI reserves the right to suspend or terminate any participating farms for violation of or non-compliance with the Farm Fresh RI rules and quality measures. On rare occasions, there may be an exception determined by Farm Fresh RI staff based on regional availability of products. * All sampling at our farmers markets must follow safe food handling guidelines. Prepared foods must be licensed by the Rhode Island Department of Health. Vendors must sell at least three (3) items with ingredients grown in RI, CT, or MA. We require the display of the farm and state origins for the locally sourced ingredients at your stand each week. Vendors must provide receipts, if requested, of items in question. All sampling must follow safe food handling guidelines. For any vendors providing samples or prepared food, we require a copy of your food safety plan in writing at the start of the season. Limited space is available per season. Your food truck business must be a physical food truck. Please do not apply for a food truck space as a prepared food vendor. Your truck must have been in business for at least one (1) full year. Food trucks must sell at least three (3) items with ingredients grown in RI, CT, or MA. We require the display of the farm and state origins for the locally sourced ingredients at your truck each week. Vendors must provide receipts, if requested, of items in question. All of our markets are focused solely on food and agricultural products. We do not accept art and craft vendors. Only products crafted in RI, MA, or CT will be accepted. Only products made primarily with materials originating from farms in RI, MA, or CT will be considered. We require the display of the farm name and state origins for the locally sourced ingredients at your stand each week. Vendors must provide receipts, if requested, of items in question. Note to prospective new vendors: The acceptance period for the 2018-2019 season has closed. Please fill out the application if you'd like to be considered for the waiting list. We will be in touch with you if space becomes available.